It’s 2018 and you’re hard at work on your resolutions (or have already abandoned them. I’m looking at you…me). One resolution that you shouldn’t leave by the curb as you begin your journey down the highway of 2018 is your resolution to get serious about link building for your site. Since the late ‘90s, search engines have used links as a signal of a web page’s popularity and relevance. In 2018, links may not be the only part of the equation, but they are still one the top ranking signals for all of the search engines and a significant part of your time should be spent on trying to gather them. PopularityThis one is pretty self-explanatory, the more popular a site is, the more weight links from that site will carry. For example, a single link from CNN.com will count for more than a hundred links from mymomsaysimhandsome.com. ContextWhere a link comes from, as well as the subject matter of the linking site, can matter. A link from a local car club site would hold more weight than a link from your mom’s sewing blog. In addition to the context, the locality matters as well. If you have a link from a business located near you, it counts for more than a link from an identical business across the country. TrustYou’ve used the internet before, so you know how much spam is out there. It’s been estimated that as much as 60% of the internet is spam. Search engines have developed systems to sort out irrelevant content. 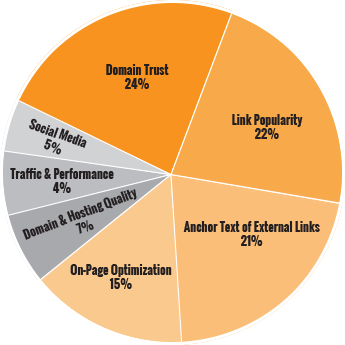 Trust is a huge ranking signal and links from trusted domains can significantly boost your rankings. Universities, government websites, and non-profits have very high-trust domains. Who You Link ToSpam is a two-way street; a website that links to spam is most likely a spammy site itself. Search engines will look at the link profile of your site so it’s important to be careful which sites you link to–a few links to untrusted sites can wreak havoc on your rankings. SocialOver the past few years, social signals have become more and more important to search engines. Links shared on social networks are treated a little differently than much more “permanent” links on websites, because social links tend to get buried by constant social updates. Search engines are constantly adjusting their algorithms to include social signals, so make sure that you are creating share-worthy content. Check Competitors’ BacklinksUse an SEO tool that will analyze your competitors’ backlinks and let you see what they have and what they are doing. There are a multitude of tools on the market to achieve this and each of them does something a little different. We recommend using Moz’s Open Site Explorer, Majestic, SEMRush, or Ahrefs to look at other dealers who rank higher than you. You’ll be able to see where they are getting their links so you can replicate it. Get Your Customers To Link To YouThis one is simple. Your customers have websites, so ask them for a link. If you have vendors or partners, that you work with regularly (that detail shop up the street or that shipping company you use would be great options), ask them for a link! Start a Blog (and Make It Awesome)So many dealerships start blogs and then just write about cars that they want to sell or cars that are on their lot. That is not the best way to go about it! Blogs are your opportunity to add fresh, useful content–it’s even recommended by Google. Write valuable, informative content. You are a car expert, share that knowledge and people will begin to link to you. Real World StuffYour website is online, but your business most often isn’t. You exist in the “real world” and it’s time to do real stuff. For example, Ford sponsors the “Drive One 4 UR School” program where they donated money to schools for every verified test drive. Guess what happens when those events happen at local dealership? They get links. Sponsor a Little League team. Volunteer at a charity event. Get involved in your community. Don’t manufacture reasons for people to link to you — do real world stuff and they will link to you anyway. Be SocialSocial media has become more than a place for you to post pictures of your vacation to Jackson Hole, WY or what you had for dinner last night. Social media sites are news sources – news breaks on social media sites first because the audience is ALWAYS listening. Spread links to your dealership’s website on social media. Got a new blog post? Share it. Big sale next weekend? Probably a good idea to share that link. If the information that you share is useful, the people who read it will share it also. The more your posts are shared, the more likely it’ll garner a link. Avoid Free DirectoriesSince Google’s release of the Penguin update, low quality links are no longer a good signal for your website. There are thousands of free directories out there where you can list your site, but this tactic is no longer recommended. Pay attention to what kind of directory it is — if it’s relevant to your dealership or business, it’ll be okay — but if it’s generic or for another type of business altogether, stay away. DO NOT BUY LINKSI don’t feel I can say this enough — DO NOT BUY LINKS. There are hundreds of websites and services that offer to sell you links. Avoid them like the plague! Search engines devote an enormous amount of effort to detect purchased links. You will NOT outsmart them! Websites that get caught buying links can get penalized or even banned from search engines. It’s not worth it. These are fantastic ways to get your dealership’s site new links for this new year, but by no means are they the only ones. If you need more ideas for link building, feel free to contact us with the form on this page or give us a call for more information.